This is by far one of the most fun and rewarding designs I have created thus far. I designed the Mystic Mermaid Cocoon for Brianna Creative and shared pictures of my progress on social media along the way. Due to the huge viewer response, I have decided to publish the design as a written pattern. A mermaid crochet cocoon is a photographer’s favorite among a whole slew of newborn photography props, making this a must-have item in your Etsy shop or craft fair. The sizing of this pattern is quite versatile. Used for newborns, it becomes a cocoon to wrap your little one up to the shoulders. When used for older babies, it becomes more like the traditional mermaid tail around the hips. Either way you choose, it sure is darling isn’t it? Red Heart Boutique Unforgettable is no doubt one of my favorite yarn and it works beautifully with this design. There are several colorways which would be perfect for a mermaid crochet cocoon. I have chosen to use the colorway called ‘Tidal”. The little lady in the photograph below is also wearing a complimentary headband. You can find the free pattern for the flower here at B.hooked Crochet. I have crocheted the small spiral flower and can be viewed as a written pattern with video tutorial here. Please do not copy, sell or redistribute this pattern without first obtaining my permission. Items produced using this pattern may be sold, however please do not use the photo above. 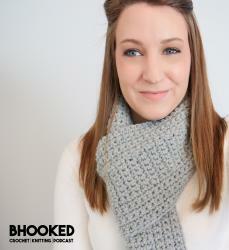 This pattern is worked in two separate pieces, the cocoon and the tail. The tail is sewn onto the cocoon after crocheting each piece and the ruffles are crocheted onto the cocoon at the end of the project. The ruffles are created by using the double crochet cocoon as a framework to zig-zag up and down the posts in clusters of 5 double crochets for three separate rounds. This is the most difficult portion of the pattern to relay into words, but once you get into a groove, is actually quite easy. The finished cocoon will measure approximately 24″ in circumference. When laid flat it measures approximately 12″ wide and 20″ long. Fasten off and weave in your ends. I recommend wet blocking the tail before sewing it to the cocoon. Assembly: Lay the tail, right side facing up. Lay the cocoon so that the base is directly centered and overlapping the tail approximately 2 inches. Fold the right side corner of the tail to the left. Thread a spare piece of yarn with a darning needle and whip stitch the corner of the tail over the cocoon. Leave that sewing end in place. Fold the left side corner of the tail to the right and sew it in place with your darning needle. Once you have the tail secured in place, it’s a good idea to stitch around the back of the tail as well. Weave in your sewing tail once it is secure. Fasten on at the back of the cocoon by wrapping it around the chain 3 of your join on the second to last round. Dc 4 more times up the chain 3. Rotate your cocoon 90 degrees counter clockwise and Dc 5 times in between the next 2 Dc. Rotate your cocoon 90 degrees counter clockwise and Dc 5 around the next Dc post. Rotate your cocoon 90 degrees clockwise and Dc 5 times in between the next 2 Dc. Rotate your cocoon 90 degrees clockwise and Dc 5 times around the next Dc post. Repeat this back and forth zig-zagging motion all the way around your cocoon. Once you have reached the beginning join with a slst to the 3rd chain. Fasten off. Fasten on again in the same place on the back of the cocoon but skip one row down. Repeat the same steps for the previous round of ruffles. Join with a slst to the 3rd chain once you have gone all the way around the cocoon for a second round of ruffles. Fasten off. Fasten on once more in the same place on the back of the cocoon but skip one row down again. Repeat the same steps for the previous round of ruffles. Join with a slst to the 3rd chain once you have gone all the way around the cocoon for a second round of ruffles. Fasten off and weave in all ends. Need help with the ruffles? I sure don’t :/ Do you have some stitch markers handy? You can mark each of the slip stitches to help you know where to work. Another tip is to make your slip stitches as loose as possible. This will make them easier to work into. Hi Brittany, I’m almost finished making this for my newest grand-niece and I love it. Only issue I’ve had is you said you used two skeins of Unforgettable but I’m on my third, and a little worried I may not be able to get four rows of ruffles! Not sure if it’s something I’ve done wrong but it’s worked out to be just about the size you said. Oh no! I’m assuming you’re using the same yarn? If you’re worried you won’t have enough and can’t get more, you can always leave off the final 3 or 4 rounds so save some yarn. Best of luck! I have a question, the ch 3 at the beginning of a new ’round, is it to be counted as a DC (part of 16 sts in row 3-4)? Hello Brittany am new here on your website. I love the pedals and fell in love with the mermaid baby pattern..I was wondering if you have an adult mermaid pattern. 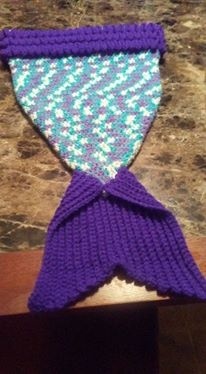 My daughter in-law is into mermaids and I would love to make a snuggle wrap for her bday n April which is also a move in to their first house. Thank you kindly. I’ve had many requests for a larger version of the mermaid tail but haven’t got around to working up the pattern. I really hope to add it to my schedule early this year! I attached the tail a little differently than your instructions, but followed all the steps, and LOVE your pattern!!! I do have to now adjust to make one for my 6yr old since she watched me make it for a friend’s baby daughter. Hi Brittany love your Pattern Mystic Mermaid ca on and wanted to know if you have the knitting version for if? I chrochet a little but better at knitting? I have twin great granddaughter who really want mermaid tails – and this is the prettiest one I’ve seen. They are in the 1st grade and wear a size 6 – does this pattern come in larger sizes? I have stupid question about the very first row. It says Ch 4. DC 7 times into first chain. Join with a slst to the 3rd chain (8 sts). If you don’t do a chain three before you start the DC 7, how will you end up with 8 sts? You’ll only have the 7 DCs. Am I missing something? I started mine with a magic circle chain three and did the 7 double crochets because I was confused about the way it was written. This took me two days to finish. I’ve been looking for a pattern like this and I’m so happy to have finally found one. I didn’t include as many ruffles because I was short on time but I wish I could’ve made them thicker. Hi! I’m a photographer and I took a photo of my daughter in your mermaid tail. I’d love to give you a digital copy of my photo to use on your site if you’d like. Please just give me your email address. 🙂 Thanks! The ruffles are added last, after you finish the cocoon portion. It all starts at the bottom (not including the tail, which is made separately and attached later). Wish there was a picture of the assembly part. I’m getting ready to sew the tail but as a novice I’m quite nervous I’m not doing it right! Is this US or UK terms? I’m looking for a mermaids crochet pattern for an 18 – 24 month old. Do you have one? I think this questions was asked but I don’t see an answer. For the tail , starting row 3 to 4.. the stitch count decreases but it doesn’t say how its decreasing.. do i turn once completing the amt of stitches stated leaving the remaining stitches untouched ? I am assuming this is the case but wanted to verify.. As well as is there a way to increase the size of this? i would imagine continuing the increase row followed by a regular row , increasing in the same pattern till the circumference is about the size you need then start the identical rows for length and increase again till long enough would work? am i on the right track? I am using red hear unforgettable dragonfly cause i love the darker blues and it looks great so far! thanks for sharing this pattern! I can’t believe your giving away this beautiful pattern! But that’s fine with me!!!! I will be making this! I would love to make this for a 4-year-old. Can it be made bigger? I’m a highly experienced knitter but a novice crocheted. i finished mine.. up on Etsy..
That’s what I am having trouble with. Also tail says work in back loops but for slip stitch at beginning of rows that leaves a weird top edge. Should I slip stitch in both loops? Wish I could answer you. I am having the same problem. I found another pattern for the fin. For the tail, I used stitch marker to mark the 25th sc. Then on Even rows 2-16, work hdc to end of row leaving last stitch from previous row UNWORKED (there’s your decrease). On odd rows 3 and beyond, sl st in back loops of hdc from rows below. If you use marker, you won’t even have to count stitches. Even rows 18 and beyond, INCREASE by working 2 hdc in last stitch. Do NOT leave any stitches unworked! Always mark the 25th sc. Again, you won’t even have to look at the pattern! ALL STITCHES ARE PLACED IN BACK LOOPS! I was having the same problem with the slip stitch. I was making them too small. I loosened up my grip and made sure the stitch was bigger. Hope that makes sense. Hi Kathleen! This pattern recommends a 4.5 mm crochet hook. Red Heart Unforgettable is a roving style yarn which means it is a single ply. If you plan to substitute for a different yarn, stay within the worsted weight category and make a gauge swatch so the project turns out the proper size. I am struggling with the tail. Not sure where I am going wrong. Either my stitch count remains the same on each row or I end up with too few. I am sure it is when I chain 1 at the end of the row. Do I chain 1 turn and that counts as stitch one or do I chain 1 and then stitch into the lady stitch of last row. I have ripped it out twice and thrown it out one other time. Friend’s baby girl is due any day and I want to have this ready so they can take her home in it. To my understanding, you leave the last stitch of the row unworked (so one edge becomes diagonal/decreases in size). That’s what creates the split in the fin. Does that answer the question/solve the problem? Thank you for the cocoon mermaid pattern I just love it. Instead of the ruffle I’m going to crochet star fish in a finer yarn to stitch around the top of cocoon. Does the chain 3 count as a double crochet? count exactly if it is..
Would really like to make this for my 8 year old grand daughter as well. Has anyone told you how to make this bigger? Just finished the cocoon and ruffles, and working on the tail now…..I’m worried about where to place the seam….I used the candied color of the red heart boutique and its a lot more stripy than the tidal, so I can see where every row begins and ends. Should the seam be on one side, or in the middle of the back? Thanks in advance, and I love this pattern!! I bet this pattern looks fantastic in candied 🙂 Typically you would put the seam in the front, (since it doesn’t really look like a traditional seam) but I can see your dilemma with this colorway. You could switch it around and place the seam in the back, or you could keep it as the pattern suggests and put an embellishment over the seam (a flower, gem or button). I bet that would look really cute! “Join with a slst to the 3rd chain” what does it mean? 3rd chain… 3. and 4. round it becomes one more stitch… for example you say 24sts and it becomes 28sts… please help!! Is there any way to get the pattern to fit girls of about 5 or 6? couldn’t you simple add more to the starting chain? I have a question about the ruffles, I’ve been unable to see a tutorial for how to do them. Please if you have some suggestions I would greatly appreciate it. I adore this pattern. Hi there. I love your pattern. Thanks for sharing! How are you decreasing the stitches in the tail portion of the pattern? Am I missing something? Thanks so much!! I have finished the cocoon, but I am puzzled by the tail… the number of stitches goes down, then back up.. I am having trouble visualizing this… since you said there is no decrease? Hi Shirley! I do not have a PDF pattern available to send you but you can copy the pattern text and paste it in Microsoft Word (or any other text editor) to print a copy for your personal use. I just posted pictures of the Mystic Mermaid Cocoon I made using your pattern. I love this pattern. Thank you so much for posting it! I love this pattern and the many others you have provided. I am expecting my little girl in August and really want to make this pattern for her. I am new at crochet and more of a visual learner at some point will you do a video tutorial for your viewers to follow for this pattern? Hi Tera! I’m not sure if I will do a tutorial on this pattern or not. If the ruffles are giving you some doubt, I do have a video explaining how to crochet them on the Ruffled Baby Booties. The technique will be the same for the cocoon. I bet you can make this cocoon no problem 🙂 I’m always more than happy to help you through the written pattern. You can contact me via email or Facebook for pattern support. Thanks Brittany! the ruffles are definitely making me second guess myself but I’ll cross that bridge when I get there. I have actually started the pattern which is very easy to follow. I will definitely watch the ruffled bootie tutorial as a reference for the ruffle once I complete the cocoon. I am confident I will finish this project in the next few days. Again Thank you for providing the pattern and taking the time to offer help. Omg I was just thinking the same thing as donna197 . Lol. Brittany, you’re so talented! I made the overlapping flower for a friend and it’s beautiful. I’m so glad I found your page. I just love looking at what you come up with. Will be checking periodically and I know I will make another of your creations again! You’re very kind to be sharing your patterns. Thank you! Thank you so much! I’m so glad you found me as well 🙂 Hope to see ya back soon! Hi Kyla! The approximate gauge for this pattern is 8 stitches x 5 rows = 2″ square. My finished cocoon was approximately 12″ wide x 20″ long. This translates into about a 24″ circumference. Congrats on your baby girl! Just found your blog – love your patterns! I’m inspired by the neatness of your stitches and your eye for color. Thank you so much for sharing. Oh so Cute. Will someone please have a girl so I have a reason to make this. It is Darling. Awesome job Brittany! I really enjoy your tutorials .